This repository is a fork of Apollo maintained by the LG Electronics Silicon Valley Lab which has modified and configured to facilitate use with LG's Automotive Simulator. Select the San Francisco map and the XE-Rigged-apollo_3_5 vehicle. Enable GPS, IMU, LIDAR, Main Camera, and Telephoto Camera. (optional) Enable Sensor Effects, Traffic and Pedestrian. Select the XE_Rigged_Apollo3.5 vehicle and San Francisco map in the top right corner. 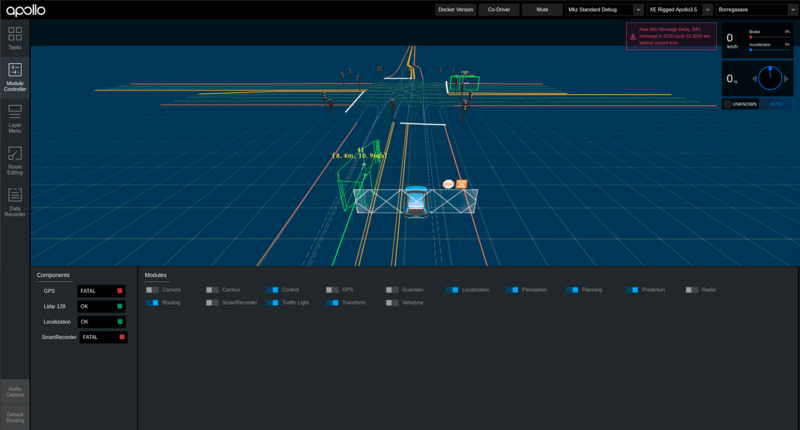 Enable Localization, Transform, Perception, Traffic Light, Planning, Prediction, Routing, and Control. To stop the docker container run the dev_start.sh stop script in apollo/docker/scripts in a new terminal (not in the docker container).